Tapestry2008: Chicks on speed and the Victorian Tapestry Workshop. 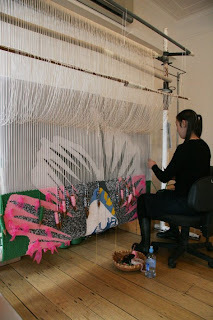 Chicks on speed and the Victorian Tapestry Workshop. Anna Clabburn has written an article Chicks on speed for the latest issue of Craft Australia's newsletter 716 craft.design. 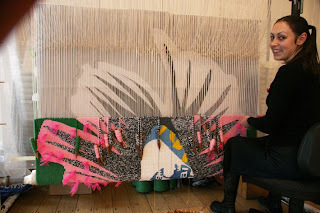 The tapestry project was initiated by the Chicks who have already worked with Craft Victoria. Suitably, collaboration is also a mainstay of the VTW's mandate and is inherent in the nature of the tapestry medium itself.